For high-flyers looking to live atop of Montreal, Le Peterson is home to a wide range of penthouses with spectacular city views, fine features and outdoor space. Benvenuto Group and Malen Capital are offering expansive suites on the 28th to the 31st floors ranging from 1,060 to 1,517 square feet in size. 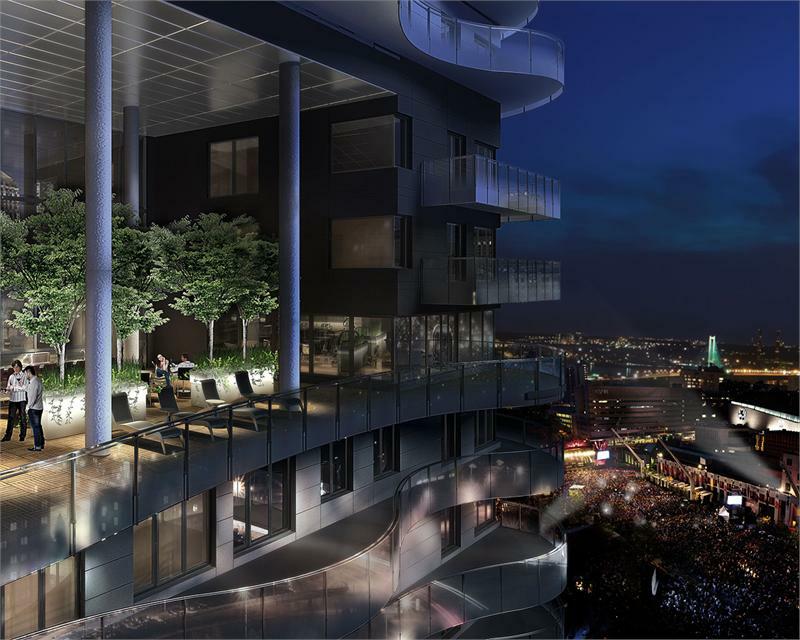 Residents can expect luxurious finishes in the top-tier suites. Bryon Patton & Associates are behind the sleek interiors of the project. Choose between three different penthouse design packages: the Meringue, the Café au lait and the Pain au chocolat. For buyers who want their surroundings to appear cool and crisp, the classic Meringue offers finishes in winter white, pearl grey and classic washed wood. Marble and metal also make an appearance, providing the colour scheme with a bit of panache. Looking for something a little warmer? The Café au lait package will provide a soothing backdrop to everyday life with its muted taupe and tan finishes highlighted by the rich tobacco and silver shadow marble. For bold buyers, the Pain au chocolat finishes are all about drama. The palette combines opposites, teaming charbrown and ebony finishes with sleek stainless steal and Bianco Carrera marble. Whatever your style, residents will be sure to enjoy Le Peterson, a 31-storey tower situated at Rue de Bleury and Rue de la Concorde. Set in the heart of downtown Montreal, the condo is walking distance from Metro stations, restaurants and cafes and all that the Quartier des Spectacles has to offer. On-site amenities include a sky deck, climbing wall, a yoga and Pilates studio as well as a game room, guest suites, and so much more. For more information contact 514 904 8855.